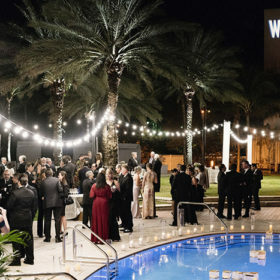 Stars of the wine and food industry will gather at the historic Lincoln Center for the awards ceremony and black-tie gala, celebrating 25 years of food at its best. On Monday, May 7, Avery Fisher Hall at Lincoln Center in New York City will be teeming with decked-out celebrity chefs, rising restaurateurs and top-notch sommeliers, among others, to celebrate the James Beard Foundation’s “25 Years of Food at its Best” at a black-tie gala, dubbed the Oscars of the food world. Hosting this year’s awards ceremony—which honors outstanding professionals in the culinary world, from restaurants and chefs to cookbook authors and media—will be Alton Brown, a James Beard Award winner, Food Network personality and author. Industry greats across the country are expected to shed their chef jackets for tuxedos to accept this year’s prestigious silver medallion—a buzz-worthy honor that’s good for business. “Chefs and restaurateurs report that being awarded a James Beard honor increases consumer awareness. Knowing that a restaurant boasts a James Beard nomination or award is an endorsement that you’ll have a wonderful meal,” says Susan Ungaro, president of the James Beard Awards Foundation. Among the evening’s highlights is the Lifetime Achievement Award for Wolfgang Puck and a special one-man play, I Love to Eat: Cooking with James Beard, performed by actor Robert Neal as James Beard. Attendees will indulge in savory and sweet interpretations of James Beard cookbook recipes created by 25 of America’s great chefs, including Sean Brock of McCrady’s in Charleston, SC, Sanford D’Amato of Sanford Restaurant in Milwaukee and Gary Danko of Gary Danko in San Francisco. Wine Enthusiast Magazine tapped the nominees for Outstanding Wine Program to find out their wine favorites. What’s currently in your home fridge? Anchor Steam Beer and Venica &Venica’s Sauvignon Blanc from Friuli-Venezia Giulia, Italy. What’s the most popular bottle ordered off your wine list? Last year, off the list, it was Edi Kebber’s Collio and Venica & Venica’s Collio Malvasia Bianco from Friuli-Venezia Giulia, Italy. What’s the most popular bottle ordered off your wine list? Pietracupa’s Greco di Tufa from Sicily, Italy. Always Champagne and it’s always Pierre Péters Blanc de Blancs Les Mesnil, along with any and all Terry Theise Estate Selections grower Champagnes. What’s the most popular bottle ordered off your wine list? Well, we pride ourselves on our mix of sales at No.9 in that the wine list sells very evenly, however, we have a house favorite in the wines of David Hirsch, whose fantastic Sonoma Coast Pinot Noirs are always the belle of our ball. His special bottling for us—a Pinot Noir that Chef Barbara and I create with him—is named “The Storyteller” after David’s remarkable imagination. What’s currently in your home fridge? Dry Riesling and Champagne. What’s the most popular bottle ordered off your wine list? Chateau Rayas Châteauneuf du Pape.